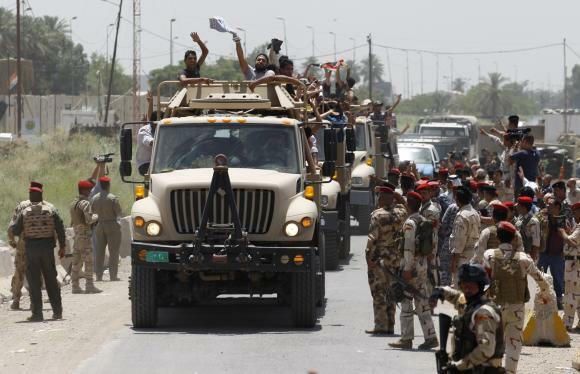 JNN 27 May 2015 Baghdad : Arabic-language al-Akhbar TV channel released footage on Wednesday showing Iraqi forces, backed by volunteer forces, have succeeded in apprehending hundreds of ISIL Takfiri militants in the country’s Western province of Anbar. The development came after the Iraqi army launched a major operation to recapture Anbar from the grip of the terrorists. The army soldiers, backed by Shiite and Sunni volunteer forces, began Anbar’s operations early on Tuesday after a zero hour set by the country’s Ministry of Defense reached its end. The second phase of the Iraqi popular forces’ operations codenamed Labaik Ya Rasoulollah 2 was kicked off on Monday to win back Northern Tikrit, capital of Salahuddin province, Southwest Samarra and Ramadi, capital of Anbar province. “The second operation stretches towards Northern Tikrit to win back control of the remaining regions of the city and Southwest of Samarra; then the forces will head towards Ramadi,” Ain al-Araq News website quoted a statement by Iraqi popular forces as saying. On March 1, about 27,000 popular and security forces started the first phase of Labaik Ya Rasoulollah military operations from several angles to take control of Tikrit and its suburban regions. They purged 97 regions and villages of ISIL terrorists and then continued to take control of main district of Tikrit and the rest of Salahuddin province. In late March, the Iraqi army, backed by Shiite and Sunni volunteer forces, made a final push against the ISIL terrorists in Tikrit, and managed to fully liberate the Northern city from the control of the Takfiri group. On Sunday, Iraqi popular forces announced that they were working on a detailed plan to take back the city of Ramadi. “This plan has two phases; first adopting a special tactic to prevent ISIL’s sudden raid on specified areas, and secondly preparing for a massive attack to take back regions currently under ISIL’s control,” Iraqi Popular Forces Spokesman Karim al-Nouri told FNA. Al-Nouri noted that the Iraqi popular forces are preparing for fresh military operations in Ramadi. “The operations for regaining control of Al-Anbar is very similar to Salahuddin and Diyala mop-up operations, but with less complexity,” he said. On Saturday, the Iraqi army dispatched five regiments of its rapid reaction forces to Al-Habaniyah military base in Eastern al-Ramadi in Anbar province to intensify the attack on the ISIL. “The rapid reaction forces will join other army units and popular forces from al-Habaniyah to Khalediya in the campaign against the ISIL terrorists,” member of al-Anbar Governor’s Office Azal al-Fahdavi said. ISIL Takfiris have recently taken over parts of Ramadi. Popular Mobilization forces have been deployed to the city to fight the Takfiris. The volunteer groups who have joined the Iraqi army, were dispatched to Anbar after Iraq’s Prime Minister Haider al-Abadi called on them to join the fight to drive Takfiri terrorists out of Ramadi. Iraqi forces have managed to recapture two more areas from the ISIL terrorists in the Western Anbar province, Iraq’s Defense Ministry announced Wednesday. Iraq’s Ministry of Defense issued a statement saying that the country’s army, backed by Shiite and Sunni volunteer fighters, expelled the ISIL Takfiri terrorists from the areas of al-Tash and al-Humayrah in Anbar late on Tuesday. Earlier in the day, the army troops also pushed back the ISIL terrorists in Fallujah as they attempted to run over the city’s university with their arms-laden vehicles. The latest developments came after the Iraqi army launched a major operation to recapture Anbar from the grip of the terrorists. An Egyptian analyst underlined that the West, specially the US, is not serious in its fight against the Takfiri terrorists, saying that the recent fall of two strategic cities in Iraq and Syria to ISIL control was, rather, the result of the US-ISIL alliance. “The simultaneous fall of Palmyra (also known in Arabic as Tadmor) in Syria with that of Ramadi in Iraq in the presence of the anti-ISIL coalition shows that the US and the ISIL are on the same side,” Abdel Fattah Mohammad told FNA on Wednesday. He underlined that anyone who looks at the developments of Syria and Iraq from outside surely sees a relationship between the simultaneous collapse of Palmyra and Ramadi. “After nine months since the beginning of the US-led anti-ISIL coalition’s airstrikes on ISIL positions in Iraq and Syria, the coalition is still incapable of preventing the ISIL advances in both countries because the US is cooperating with the ISIL,” Mohammad said. On May 17, ISIL Takfiri militants took control of Ramadi, located some 80 miles West of Baghdad after several days of intense fighting. On May 20, ISIL Takfiri militants control of the ancient Syrian city of Palmyra, also known as Tadmor. Antiquities officials fear ISIL wants to destroy Palmyra’s pre-Islamic cultural treasures, which include colonnaded streets and ancient citadels. This entry was posted in Iraq News and tagged Anbar, Anbar Province, Arrests, Iraqi Forces, IS terrorists, Ministry of Defense, Shia Volunteers, volunteer forces. Bookmark the permalink.